The “Rally for Civic Engagement” is Lowell Votes’ premiere annual event in which we invite all candidates running for office that will appear on a ballot in Lowell to give a short speech and then talk one-on-one with rally attendees. The 2016 Rally will be held on Friday, September 2, 6:30 pm on JFK Plaza in front of Lowell City Hall. The event will feature nonprofit and advocacy group tables, music, and decorations in a festival-like setting. The new food truck “Let’s Roll” will be there. As a fun incentive, candidates will be given sashes and can earn badges by talking to the tabling groups and learning about the issues they care about. Please join the event on Facebook and share the word! We’ve got three exciting things to share this week! The 2016 Primary Guide, a collaboration between Lowell Votes, Cambodian Mutual Assistance Association, and Coalition for a Better Acre, is here! 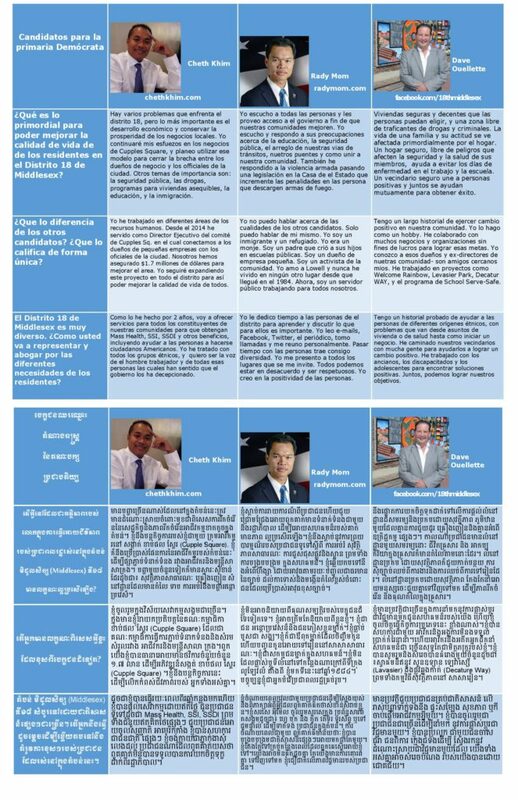 Check it out if you live in the 18th Middlesex District: In Spanish, Khmer, and English! Our first public meeting is Monday, August 22, 2016, at 6:30 pm, at the Pollard Memorial Library. Be there for food and workshopping our 2016 program. We can’t do it without you! The 2016 Rally for Civic Engagement is coming September 2, 2016! We still have tables left for groups or nonprofits that want to collect signatures, share information, get volunteers, and most importantly meet the 2016 candidates for local and state offices! Click on the images below for the high-resolution PDF version! 1. It’s your right! There are people still fighting for the right to vote and influence their government. Use your right and make your voice heard. 2. Local elections have a local effect. Electing representatives that you respect and making sure they follow through on promises will lead to a better city. 3. Your vote has a big impact! There are 58,000 registered voters in Lowell but only about 1 in 8 vote locally. Since smaller numbers of people vote in local elections, your vote could be the difference between someone winning or losing. 4. Elected officials listen to people that vote. Send a message about what matters most to you by voting and speaking with your elected officials. 5. Not voting sends a message, too. If not many people vote, people think that everyone is happy with the way things are, and they might not work toward making things better. 6. Your tax dollars are at stake. City councilors and school committee members vote and make decisions on how money will be spent in Lowell and in the public school system. You can vote to make sure those you trust are in charge. 7. Even if you rent a home, local elections are important! Costs of taxes are often passed on to renters and customers as higher rent and prices, and the local officials make decisions about roads, schools, and many other services. 8. Even if you don’t have kids, the school committee is important! A strong school system creates a strong community, influences property values, and impacts your neighbors. Make sure people you trust are in charge! 9. Local government helps our economy! Decisions that support a strong business community bring money, jobs and positive growth to the city. 10. Voting is good for you! Having a say in the local government has been shown to make people feel more connected to their community and healthier! Copyright © 2019 Lowell Votes. Proudly powered by WordPress	& The WP Theme by ceewp.com.